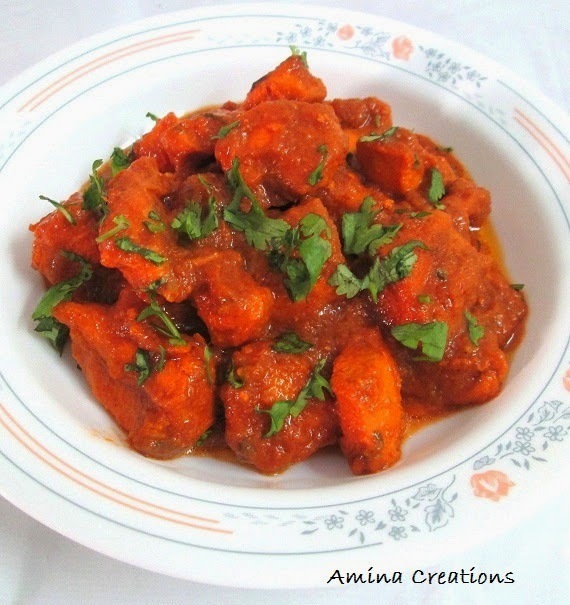 Chicken masala gravy is a delicious and mouth watering gravy that you can make on special occasions and feasts. Ground onions and green chillies add a nice flavour to the gravy and the pureed tomatoes and chicken masala give a nice red colour. The gravy tastes great with both Biryani and roti. Take onions and green chillies in a mixer jar and grind to a paste. Grind the tomatoes as well and keep ready. Take a pressure cooker, add the onion chilli paste, tomato paste, curd, salt, chicken masala powder, lemon juice and ginger garlic paste and mix well. Add the chicken pieces and ½ cup of water and close the lid. Pressure cook for 3 whistles. Cook for a few minutes while stirring till the gravy starts thickening. Now, add the chicken pieces as well, close a lid and cook in low flame for about 5 minutes. Garnish with chopped coriander leaves and serve hot with Biryani, roti or as a side dish with rice. 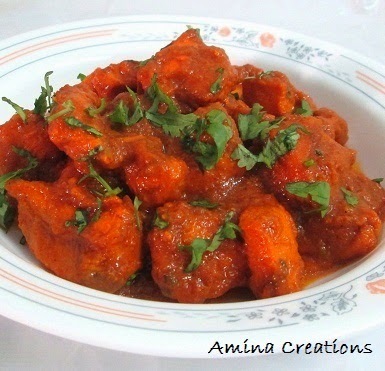 Chicken masala gravy looks delicious.